Judith Haschert and Michael Berchtel share their passion for flying and travel. They've already travelled to numerous countries together, discovered many new things and experienced a whole range of different cultures. However, they've developed a soft spot for Tel Aviv. In terms of culture and cuisine, Michael assures us that "this city has an impressive diversity." You can be sitting on the beach one minute, and enjoying the vibes of the city the next. Tel Aviv is Israel's second city after Jerusalem. It started out as a suburb of the port of Jaffa, before the two cities merged in the 1950s. The weather is good all year round. "It can get very hot in summer, though," says Michael. The best times of year to visit Tel Aviv are spring and summer. 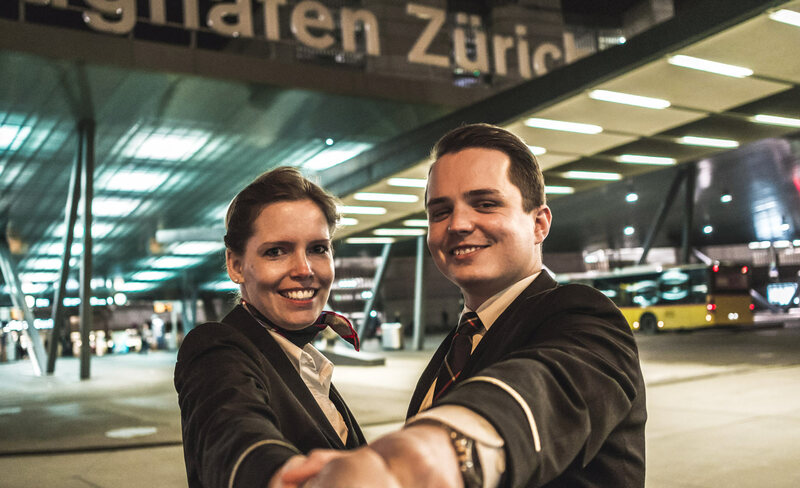 SWISS operates daily flights to Tel Aviv (TLV) from Zurich (ZRH). The day gets off to a good start close to Ben Yehuda Street with healthy, home-made food. "The coffee in Café XoHo is out of this world!" raves Michael. This café attracts its many customers with delicious, fresh food, served in a bright, colourful setting. "The walls are lined with different works of art. Everything is bright and colourful. The café pulls a mixed crowd, including tourists, students and business people." A little bit of exercise never hurt anyone after such a copious breakfast. Frishman Beach is just a stone's throw away from Café XoHo. It's an absolute must for Judith every time she comes here. "This is my favourite place in the world." Frishman Beach is Tel Aviv's most popular beach with wide sandy beaches – and lots of people! If you want to get to grips with Tel Aviv, you should head along to this beach on a Friday or Saturday. The crowds – both tourists and locals – gather here to catch the sun, have a swim or simply to be seen. Depending on the time of year, the beach is also the perfect place for a dip before breakfast. "It's almost too warm in summer, but it's wonderfully refreshing in autumn and winter." After the beach, it's time to head into the city. The centre of Tel Aviv, home to over 4000 Bauhaus-style buildings, is a haven for lovers of great architecture. "You can discover the most beautiful buildings on a guided tour, or with an audio guide or map," explains Michael. Visiting the Bauhaus buildings is certainly hungry work! There's still a while to go until lunch, so we've got time for some liquid refreshment. The main streets, such as Rothschild Boulevard, are home to a myriad of small Juice Shops. Judith is a big fan of quick vitamin fixes. "Anyone who loves fresh juices is in paradise in Tel Aviv! So delicious – and healthy, too!" A quick walk through the streets of Tel Aviv brings Judith and Michael to their lunch spot. "Are you ready for an interesting combination? Then let's go to Nanuchka!" This place serves up Georgian vegan food. "The food's fabulous and service very attentive – and there's a mixed crowd, too," explains Judith. It's also a good idea to eat here in the evening – "when the party really gets going!" It's now time for a leisurely stroll through the Bohemian quarter – home to artists and creative minds. There's plenty to be found in this district. "There's impressive graffiti around every corner as well as an endless number of cafés and bars." Florentin has something for everyone – whether coffee and a cake or an aperitif. Jaffa is known as the 'town of a hundred orange groves' and used to be famous for exporting its oranges around the world. "Here, at the southern end of Tel Aviv, you feel as though you're in Arabian Nights," explains Michael. "Enjoy the picturesque Old Town, then close your eyes and make a wish as you stand beneath the Statue of Faith." Jaffa Port is particularly romantic because it's the best place in the city for catching a beautiful sunset. "Simply wonderful!" rhapsodises Judith. And the sunset's even better when you're sipping an aperitif in the Container bar! Once the sun has set, it's time for dinner! The majority of seats at Port Sa’id restaurant are outside – perfect for warm and mild summer evenings. "The dishes are all freshly prepared and incredibly delicious. Good music and a young, fashionable clientèle are equally a part of the culinary experience." If you fancy a nightcap, then call in to Tailor Made. This former courtroom is the perfect backdrop for a good cocktail or a cool beer to wind down after a busy day. "And if you've missed dinner, there are always the tapas-style dishes here to enjoy." The inner courtyard garden is a small oasis and a cosy haven for relaxation. "The perfect end to a wonderful day in Tel Aviv!"